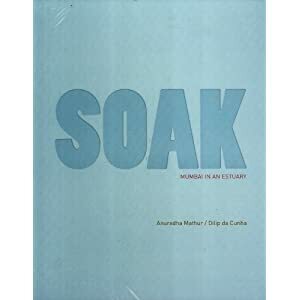 SOAK: Mumbai in an Estuary by Anuradha Mathur and Dilip da Cunha is a beguiling book that advances the leadership of landscape architecture in redefining our cities. Moving between serious scholarship about the cartographic history of India, to creating an alternative mapping of Mumbai using sections and photographs, and concluding with proposing twelve design ‘initiations’ (08) that reintroduce the ability of the landscape to soak up the monsoon – the book expands our understanding of place-making. The tension between applying scholarship to the design process is the reoccurring theme of their previous works, Mississippi Floods (2001) and Deccan Traverses: The Making of Bangalore’s Terrain (2006), and their practice as landscape architects and educators. With Soak, Mathur and da Cunha’s inquiry into iterative drawing has fully matured and engages in a larger cultural dialog (though perhaps a smaller terrain) then their previous works. Soak emerged from an exhibition at the National Gallery of Modern Art in New Delhi that was developed in response to the 2005 monsoon floods in Mumbai caused by almost a meter of precipitation falling in just one day. The book’s thesis is that artificial delineation of land from water is impossible to maintain in the territory of the monsoon and requires a new approach to place-making that enables permeable boundaries between land and sea. Historically, rainwater from the monsoon was captured on all available surfaces for use during the dry season, versus the engineered 20th century system of storm drains and sea walls that seek to move precipitation out to sea as quickly as possible and to prevent the tides from washing over former mudflats. With the failure of the engineered system to handle the deluge of 2005, Mathur and da Cunha were invited to propose alternative landscape solutions that became the exhibition and the book.